Reason for Reading: Review copy from Harper Collins via NetGalley. 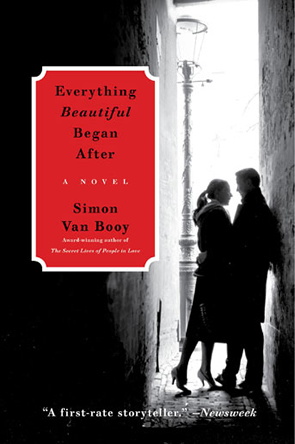 Simon Van Booy brings to the page his unique talent for poetic dialogue and sumptuous imagery in this his remarkable debut novel of love and loss, dependence and independence. Rebecca has come to Athens to paint. Born and raised in the south of France, Rebecca's mother abandoned her and her sister when they were very young, left to be raised by her loving yet distant grandfather. Young and lost, she seeks solace in the heat of Athens. George has come to Athens to translate language. Dropped off at a New England boarding school when he was a child, he has close to no relationships with anyone, except the study of ancient language and alcohol. Henry has come to Athens to dig. An archaeologist, Henry is on-site at Athens during the day, and roams the Agora on the weekend. Three lost and lonely souls whose worlds become inexorable enmeshed with consequences that ripple far among the ruins of ancient Athens. I have been hearing a lot of good things about Simon Van Booy, so when I saw there was a chance to get a copy of this book through NetGalley I jumped at the chance. I was very happy when I was approved and I finally got around to reading it the last few weeks. This is really the joy of book blogging. I have never heard of Simon Van Booy before, but suddenly bloggers that I respect were gushing about his books. I was intrigued, but my library didn't have anything by him. I was a bit hesitant to buy my own copy because I am not a huge fan of descriptive, flowery language. They have to be written just right to attract my attention. This book wound up working very well and I wouldn't have regretted it if I had bought a copy. This is the story of Rebecca, Henry, and George. They are three strangers who circumstances conspire to bring together. Rebecca and George meet first, then Rebecca meets Henry over a book in the local market, and finally Henry's boss almost runs George over bringing Henry and George together. It makes for interesting story-lines and makes you think about coincidences, fate, however you want to look at it. I thought that all three characters were written really well. The book is not very long, but you still got a good taste of who they were and who they become. I like getting to know the characters that I read about in very personal ways. The book changes narrators so you get to see the world through all three sets of eyes before the end. My biggest problem with this book has nothing to do with the author. There are letters included in the book and I couldn't get them to a size where I could actually read them. They are typewritten on a very bad type writer in a size that you would need a magnifying glass to read comfortably. I struggled through them for a bit, but eventually I gave up and just hoped the actual story revealed enough that I wasn't really missing anything. I am not sure if this is a problem with eReaders in general or just mine, but it really turned me off for a while there. I was getting really annoyed when I should be enjoying the story. Otherwise, I don't really have any complaints with the book. It was well-written, I enjoyed the settings, and I enjoyed the characters. I think the only reason I am not gushing like other people have been is because the writing style is a bit out of my general comfort zone. I am very happy that I took a chance on this book and I look forward to reading more Simon Van Booy in the future. I think I could grow to love him like other people do, but I need to get comfortable with him. I am not sure if that makes sense, but it's the only way I can think of to word it. A strongly recommended read and an author that deserves all the praise he is receiving! Oh, what a bummer about the letters! I often think that NetGalley, awesome as it is, should look at the formatting of its books before sending them off because some of them are just really horrible! But doesn't your e-reader let you adjust type size to get bigger? Mine does, but maybe that's not common. I got this from Netgalley too, but haven't managed to read it yet. I am looking forward to do so. Too bad about the formatting issues! I'm waiting on a copy from the library. I've heard so many good things about this book that I want to give the author a try. Glad you liked it. The premise sounds good. Too bad about the letters, that would annoy me. I'm never going to get caught up, am I. **Aarti: Yes, the font size for the actual book would change, but I couldn't get the pictures to change... They read the letters like they were pictures. **Marg: I hope you enjoy it! **Anna: My library didn't have any of his books, so I am glad that Netgalley gave me the chance to see what he was like. **naida: It really annoyed me. It isn't the authors fault, though, so I tried to remember that so it didn't ruin the book for me. You realize everything you have reviewed lately you have raved about, which makes me/us expand our reading lists, right? So none of us will ever be caught up.....that is the joy too, though, always knowing there are good books we haven't heard about, out there. I'd heard about this book before, but your review has tipped me over into looking for it. It's great to see you enthusiastic about reading and what you're reading again, Kelly.